I spent most of last week TypeCon, where I took three classes and attended about half of the presentations. The highlights were, hands down, the day I spent making mudpies at Hal Leader’s aptly named Paradise Press and Erik Spiekermann’s obscenity-laced presentation on opening night (big, big crush). Overall, I think this was my favorite TypeCon of the four I’ve been to, but few of the conference sessions I attended stand out, so mostly I must have liked it because of my trip to Paradise. 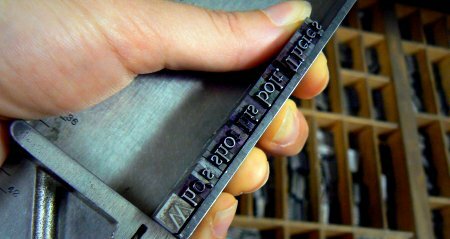 Hal’s just such a sweet guy, and he’s so enthusiastic about letterpress, and I love the smell of inky machinery, and I love doing meditative handwork like picking letters out of trays and building them into lines of text. The best TypeCon ever? Would be spending four days just doing that. I’d probably need a wheelchair afterward, though—it killed my feet to stand all day, and the next morning I discovered that I had a major sore spot way deep in my left shoulder from holding a composing stick full of lead all day.